Good planning will help you have a smooth, enjoyable party with lasting memories. 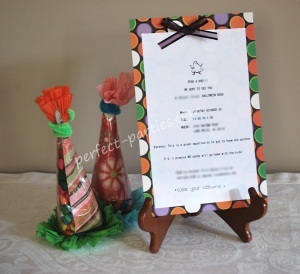 Party invitations are the first step to hosting a perfect party. Here are tips on when to send, what to include and some helpful tips. Here are some tips on sending out party invitations to make sure you have all the needed information and enough time to plan for your party. Three to four weeks prior to the event is a good time to get the invitation in the mail. This gives it time to arrive and it gives guests a chance to work around that time. Some people may be planning a holiday and could work around the date. One week prior to the event, call the parents who have not RSVP'd and that way you can ensure that they received the invitation and you can get a definite head count. Type of Celebration: At the top include what the event is: Be clear if its a birthday party or a holiday party. Name: Include the first and last name of the person the party if for. Age : Include the age of the child. Date : Include the day as well as the date of the party. Time : Include the time the party starts and ends. Location: Location of the party including address. You might even include a small map in the envelope or directions for parking. Special Attire: Specify the attire if it's a swim party, formal or requires play clothes or shoes or extra change of clothes or costume. RSVP: RSVP with phone number. RSVP Deadline: Date RSVP should be given by especially if you need a head count for a restaurant or similar place. Keep a complete guest list record to know who are coming and who has not responded. One week prior to the event, call the parents who have not RSVP'd and that way you can ensure that they received the party invitation and you can get a definite head count. If you are inviting the entire class, you can arrange to have the party invitations sent home through school and save on postage. If you are inviting a select number of classmates, it's best to mail it directly to their residence so as not to hurt feelings of children not invited. Some schools give class addresses for this very purpose. Write legibly or print using computer! Print directly on the envelope or if you are handy making labels, this is an option as well. To save postage, hand deliver your party invitations, but do NOT put in the recipient's mailbox unless you know mail has been already delivered that day. It can accidentally be picked up by the mail carrier and will not likely be returned for over a week. If you are inviting your child's entire class, you can arrange to have the invitations sent home through school. Each school or classroom has their own policy so check before sending. Use standard size invitations or you may have to pay more for larger, heavier or irregular shaped invitations. Check before purchasing or if buying from a vendor, check before printing.